Neotropic Cormorant drying its wings in the sun. If you ever drive past the the water treatment plant of Klein Hofje in the early morning of late afternoon you can sometimes see black birds, sitting on the edge of the water basins with their wings spread out in the sun. These are cormorants. These animals can also be regularly spotted at coastal locations, such as the Seaquarium. This bird is approximately 60 centimeters long and completely dark, almost black, in color. 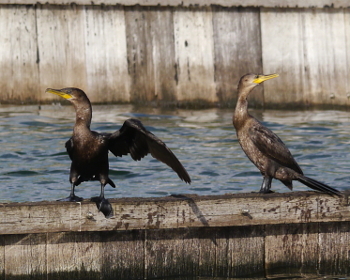 The most striking features of these cormorants are the long neck and long tail. If you have the chance to take a good look at the eye color of these birds, you’ll see that the eyes are green. The black legs resemble those of ducks, but have three flaps between the toes, unlike ducks which have just two. 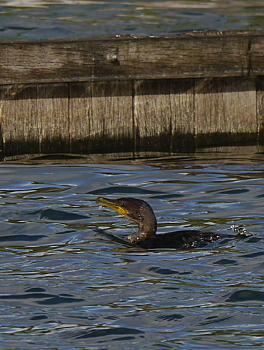 The cormorant bills have a sharp hook and are yellowish at the base. Usually a white stripe can be seen on the head behind the beak. The Deklá occurs in South and Central America and most Caribbean islands. The species occurs almost throughout the year on Aruba, Bonaire and Curacao, but breeds only in Aruba, and not on the other two islands. The animals are not only excellent fliers, they also show fantastic swimming skills, which can be a funny sight with their heads and necks protruding above the water as they move forward with reasonable speed. The animals diving abilities are spectacular. They are streamlined so that hardly any displacement occurs when they dive into the sea to catch fish. They can stay under water quite long. On Curaçao they can be observed in different locations while they are looking for food. Inlets such as Spanish Water and Santa Martha are ideal locations for the animals to fish, but they can also be seen in Schottegat sometimes. Despite the pollution of the water in Schottegat. They eat all kinds of fish, but the most bizarre is surely the somewhat infamous Scorpion fish. This fish, which swimmers do not like to stand on because of the venomous spines that the animal has on its back, lives on the seabed. Nevertheless, he is sometimes snatched by a Cormorant.